A student group at one of Canada’s most prominent universities has started a motion to boycott and sever ties with – yeah, you guessed it – Israel! BDS, the latest flavor of anti-Semitism in academia, has gained ground in The University of Waterloo, a heavily tech-oriented and apolitical school, which undoubtedly contributed to its spread through the student body like wildfire as the Palestinian’s lies and fabrications lacked any strong opposition. Under International Human Rights Laws, Palestinians, as the occupied, have the right to self-defence. As a group we hold no position on Hamas or any other political group, and acknowledge that no sole group represents all Palestinian people. The boycott movement, in its non-violent approach, actually aids in furthering other non-violent initiatives in solidarity with the Palestinians. Seriously. These BDS advocates just spent an entire paragraph trying to convince readers that they’re actually not Jew-hating terrorist apologists, and then proceeded – in the very next paragraph – to defend a terrorist organization who’s sworn mission is Jewish genocide and the destruction of Israel. According to their logic, the stabbings of innocent Jews and rocket fire at Israeli civilian areas is “self-defence” from Israeli occupation – and this is all while claiming that Israel’s really the bad guy here, and any response to these acts of Palestinian terrorism is not in fact self-defense, but is terrorism. We don’t hold a position on this. Our concern is a humanitarian one. There are human rights abuses being committed daily against Palestinians. We are focused on ending those abuses as part of the global movement of Boycott, Divestment, Sanctions. The reason of course they won’t hold a position has nothing to do with “humanitarianism.” If it did, they would be condemning actual terrorist organizations like Hamas and the Palestinian Authority rather than going after Israel. The real reason they won’t hold a position is that they don’t recognize Israel’s right to exist as a Jewish state with Jerusalem as its capital. It’s that simple. This is why they openly refuse to condemn Mahmoud Abbas and the Palestinian Authority. 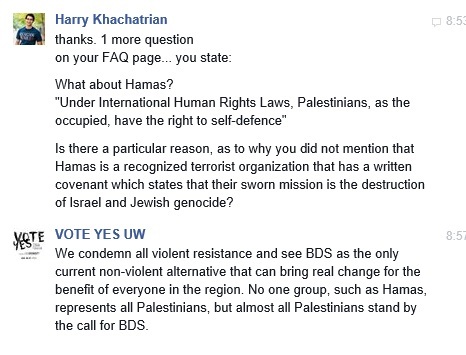 To a dig a little deeper into their motives and rationale, I contacted Waterloo U’s BDS movement. 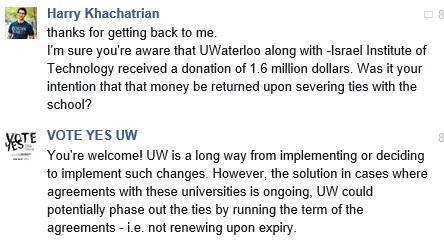 First I asked them about the recent large ($1.6 million) donation Waterloo University has received in conjunction with the Israel Institute of Technology – a prominent university which works with Waterloo to continue research in quantum information science, nanotechnology and water. Okay, now that the ice was broken, I thought I’d inquire how they fail to exclusively condemn a terrorist organization that openly calls for the annihilation of the Jews. Okay, so to their credit, they condemn violence. However, again it’s not violent terrorism or violent aggression, it’s resistance. This is highly disingenuous; Israel has never attacked the Palestinian Arabs. They have only acted in retaliation. Furthermore, they say that “No one group such as Hamas represent all Palestinians,” well, truth be told – and believe me, it doesn’t get told much – the Palestinians were, after all, the ones who overwhelmingly voted for Hamas’ leadership in 2005 after Israel withdrew their forces from the Gaza strip. All in all, there isn’t a shred of honesty here. Seriously, Palestinian Arabs live in Israel, where they vote and can serve in the parliament. There are political parties in the Knesset that are not for the existence of the Jewish state. Oh, and you know what the most popular baby name was in Israel last year? Mohammed. Yup, that genocidal ethnic cleansing is going really well, isn’t it? If the Palestinian Arabs, and these anti-Semitic BDS folk want a peaceful resolution between the State of Israel and the Palestinians, all they have to do is renounce terrorism against the people of Israel and recognize Israel’s right to exist as a Jewish state with Jerusalem as its capital. That’s it.